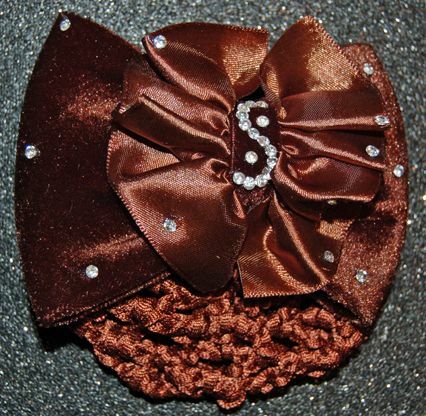 Brown Velvet and Satin Snoods are available in many styles. Each one comes with a Satin Ribbon Hair Bun Cover Net with a French Clip. Hair Bun Snoods are the perfect hair accessory item to keep your hair neat while creating a fashionable beautiful look. Select from the latest Jazpizaz collection. Many styles with Twin Bows and Rhinestone Accents make these Hair Bun Snoods uniquely different for many occasions. 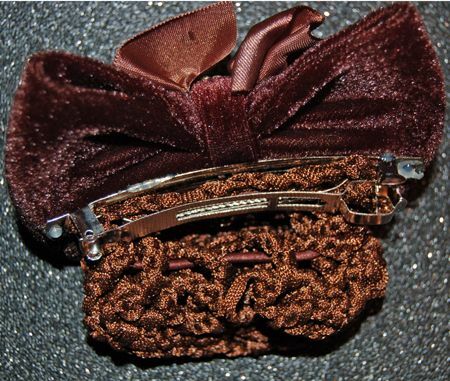 Beautiful ruched brown satin bow with rhinestone accents and a brown velvet bow backing includes a satin ribbon snood which creates an elegant look. 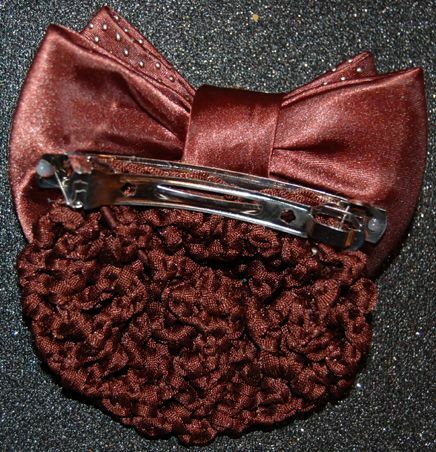 Ruched Satin bow is gorgeously backed by a brown velvet bow with a brown satin ribbon snood attached. Center acrylic rhinestones add a sparkle glitz. 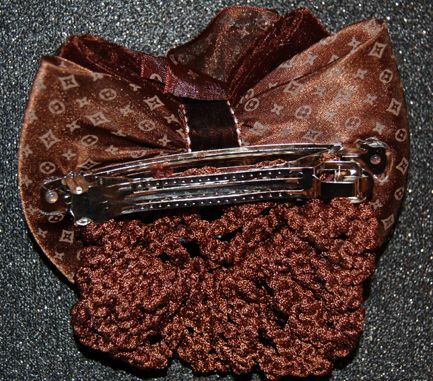 Size 4 1/2"x 4 1/2"
French Snap Clip Size 3 "
French Snap Clips Securely fastens to hair. 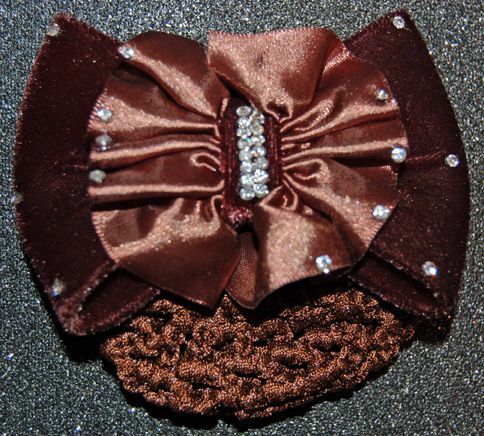 Elegant Brown Hair Bun Snood has Satin and Velvet Bows with Rhinestone accents creating a beautiful presentation in your hair. Satin Ribbon Hair Bun Net completes the style in your hair. 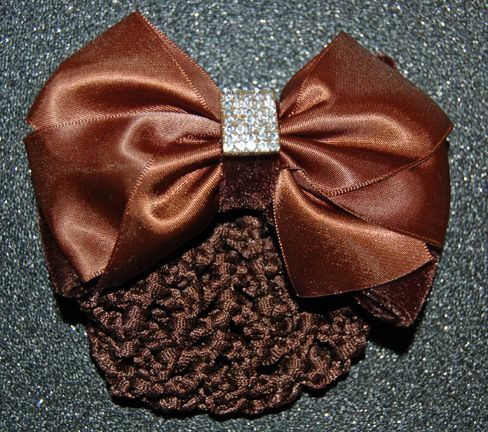 Overall Size 4 1/2" x 4 1/2"
ONE OF A KIND BROWN CHIFFON, SATIN AND VELVET BOW HAIR BUN SNOOD. PRINT AND RHINESTONES ACCENT THIS HAIR ACCESSORY PIECE FOR A DIFFERENT HAIR BUN SNOOD LOOK. 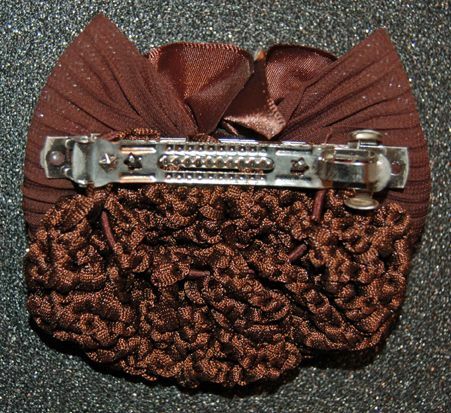 INCLUDES A SATIN HAIR BUN RIBBON NET. 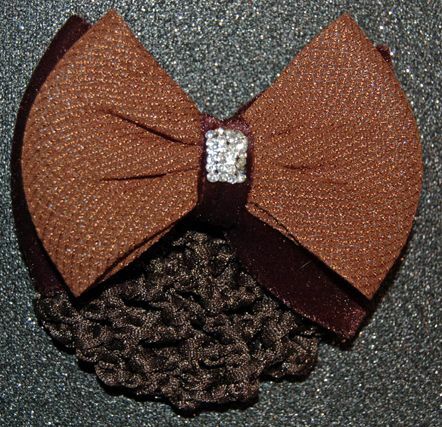 OUR MOST POPULAR BROWN SATIN HAIR BUN SNOOD WITH A SQUARE RHINESTONE ACCENT ON CENTER. THIS SNOOD OFFERS SIMPLE ELEGANCE TO ANYONE WHO WISHES TO WEAR A BEAUTIFUL SNOOD THAT INCLUDES A FRENCH CLIP ON BACK AND SATIN RIBBON HAIR BUN NET. 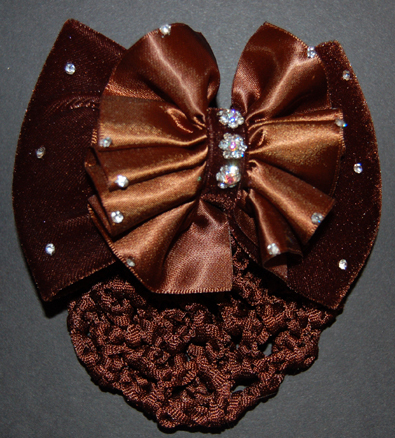 BROWN SATIN VELVET HAIR BOW SNOOD WITH GOLD BEAD ACCENTS ON THE SATIN BOW. 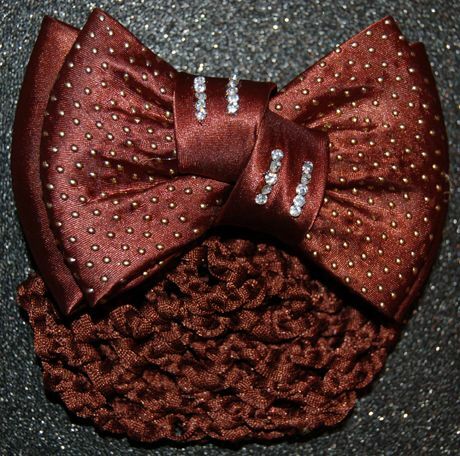 RHINESTONES ADD SPARKLE TO THE CENTER OF THIS BOW ATTACHED TO THE SNOOD. 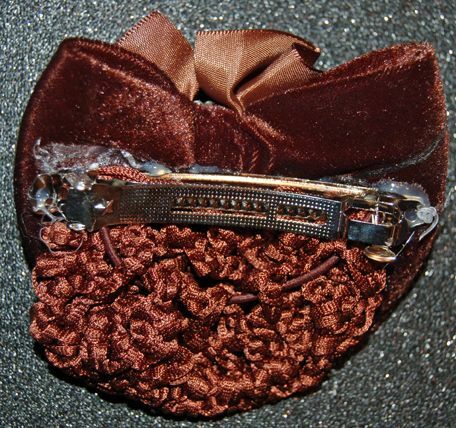 INCLUDES A SATIN RIBBON HAIR BUN NET WITH A FRENCH CLIP ON THE BACK. THIS IS ONE OF A KIND IN THIS STYLE. 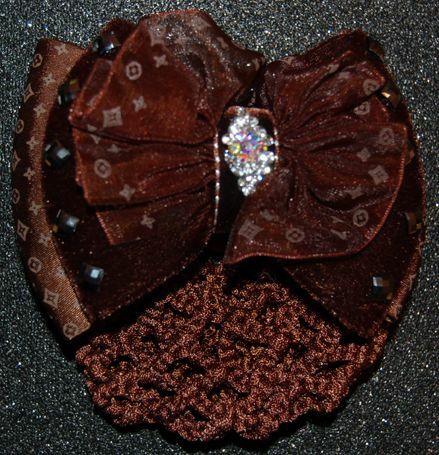 BROWN SATIN AND CHIFFON RUCHED HAIR BOW SNOOD WITH RHINESTONE ACCENTS IS A ONE OF A KIND UNIQUE LOOKING SNOOD WITH BROWN SATIN RIBBON HAIR NET. THE TEXTURED CHIFFON BOW ADDS A COMBINATION CASUAL OR DRESSY STYLE TO THIS HAIR BUN SNOOD. 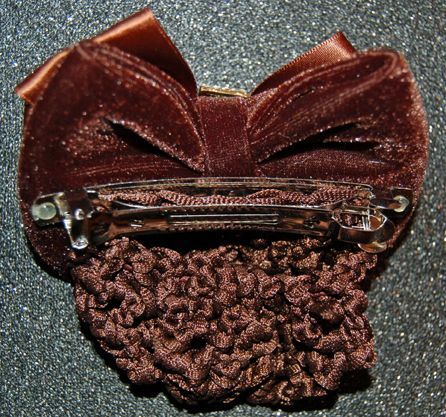 BROWN SATIN ON VELVET HAIR BOW SNOOD WITH RIBBON SATIN HAIR BUN NET. 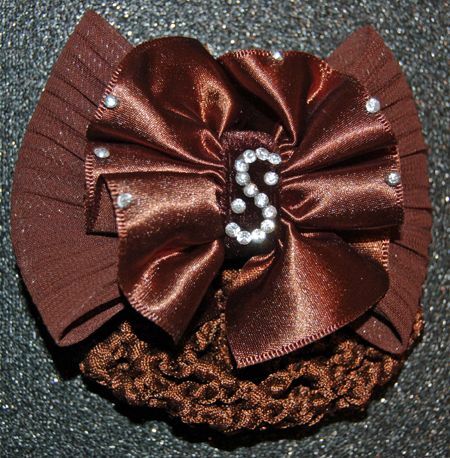 RHINESTONE ACCENTS MARKED "S" IS A ONE OF A KIND SNOOD. THIS IS THE DRESSY VERSION COMPARED TO THE SATIN CHIFFON COMBINATION. Overall size 4 1/2 x 4 1/2"